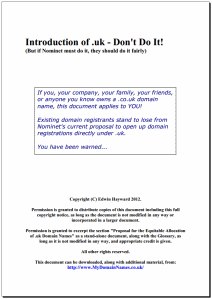 Nominet is proposing to introduce domain names directly under .uk (e.g. example.uk) for the first time. Under their proposal, trademark holders get the first chance at .uk domains, ahead of existing domain owners. Sounds fair to me. Why is this a bad thing? In a nutshell: because you can trademark ANYTHING. Not just brands and made up words, but everyday English expressions. Most distinctive brands already own their matching .co.uk domain names. The BBC own "bbc.co.uk", Starbucks own "Starbucks.co.uk", Google own "Google.co.uk" and so on. And that's how it should be. They would therefore automatically secure the matching .uk domain name to protect their brand if Nominet put existing domain owners first. Sadly, under the current proposal, Nominet is refusing to do that. And that's where things get really messy! You see, there are an astonishing number of common English words and phrases that are also trademarks. For example, did you know there are one or more trademarks on each of the following words? And this is just the tip of the iceberg (both "tip" and "iceberg" are trademarked, by the way) as there are thousands of similar examples. A service called the Dispute Resolution Service (DRS) already exists to help any trademark holder quickly and easily assert a claim over a particular domain name. This is a widely praised system that works very well, and protects the interests of brands. The DRS recognises that a trademark alone is not enough to prove a claim, especially in the case of descriptive trademarks such as the examples above. Nominet however make no such distinction. Does someone already have a trademark on your domain name? You can use the search engine at the Intellectual Property Office to check if anyone has a trademark on the word or phrase in your domain name. If it's a single word, then use search type "Exact". If it's made up of more than one word, then use search type "Contains string". Enter the words from your domain name (excluding the .co.uk part) in the box marked "Text". For example, if your domain name was example.co.uk, you would search for the text "example" as an "Exact" search. And you'd find there were 2 trademarks on example!